Hawk Measurement, a global leader in measurement solutions, introduces the OptioLaser S300 liquid laser with infrared 905 nanometer technology allowing for accurate measurement of highly- reflective, clear liquids. The new laser can be used for the detection of all types of liquids, regardless of their dielectric properties. It can accurately and reliably measure highly reflective liquids, clear liquids and even turbulence liquids. The OptioLaser, due to its narrow beam divergence, can be used to measure through grates and narrow passages, and even next to flat walls. The OptioLaser S300 liquid lasers are user configurable, allowing optimal performance of your specific application. It uses an infrared, low-gain GaAs laser diode, light energy of 905 nm. that travels to the surface of any liquid and is reflected back. This time-off-light (the time the laser pulse took to travel to the liquid and back) is then calculated into a distance. The low-gain diode allows for accurate measurement of even highly reflective, clear liquids- regardless of the dielectric properties. 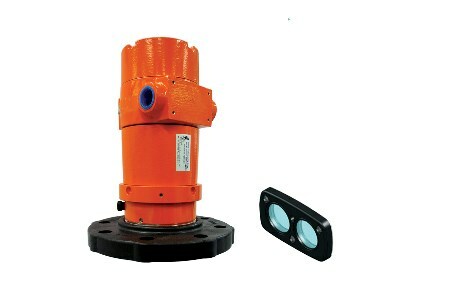 Easily measures difficult liquids such as slurries, oils, agitated liquids, even clear water. Operates without the need of any calibration. Unaffected by background noise and vapor pressure. Handles low dielectric substances and acoustically absorbing materials. It is ideal for applications with obstacles, near walls, even measuring through narrow passages.